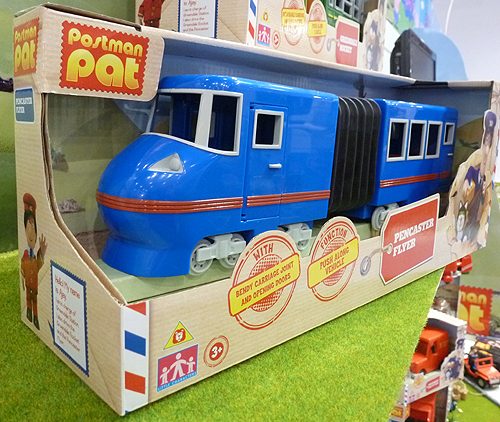 The Pencaster Flyer is a new Postman Pat vehicle release for 2013 to coincide with SDS Series 2 and the Postman Pat Movie. The new Pencaster Flyer high speed toy train now somewhat overshadows the old Greendale Rocket steam train as it features more often in the new SDS Series. 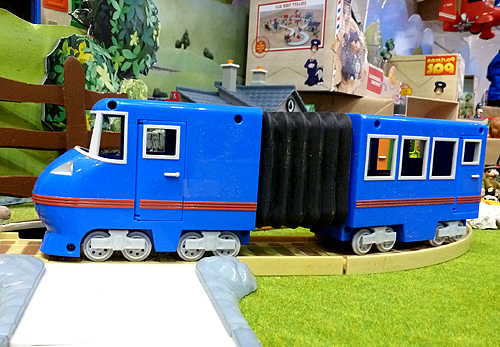 Character’s Pencaster Flyer toy train has real opening doors and features a bendy carriage joint. The Pencaster Flyer is a push-along vehicle and is in scale with Character’s Postman Pat figures. Speeding both mail and passengers between Greendale and Pencaster, the Pencaster Flyer features a red and blue livery. The Flyer, like the Rocket, is still driven by Ajay Bains.